Join UW-Green Bay Theatre & Dance for DanceWorks — a celebration of dance — April 7 at 7:30 p.m. and April 8 at 3 p.m., University Theatre, Theatre Hall. The annual event, with artistic direction by Denise Carlson-Gardner, is a concert of faculty and student choreography representing a diverse medley of styles. Choreographers are Carlson-Gardner, Kathryn Ebert, Kassie Laylan and Tristin St. Mary. 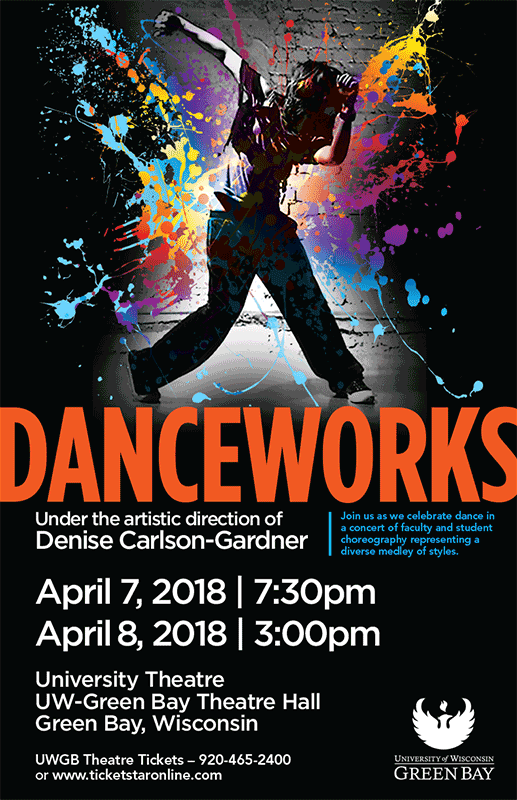 This entry was posted in Announcements and tagged CAHSS, Danceworks, Theatre and Dance on March 29, 2018 by Sue Bodilly.